Ivan Whittaker was born in Newcastle on Tyne on 9 September 1921, the younger of the two sons of William and Jane Whittaker. His father was a seagoing marine engineer. 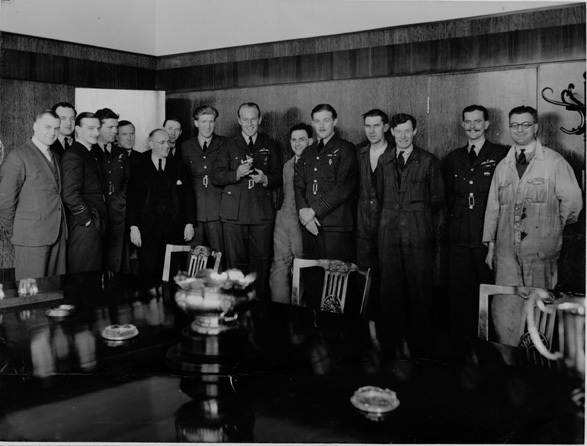 Whittaker attended Wallsend Grammar School and then, in 1938, he joined the RAF as an apprentice at the No 1 School of Technical Training at RAF Halton. He spent the first three years of the war as ground crew. In 1942, he retrained as a flight engineer and was soon posted to 50 Squadron. There he met Mick Martin and flew with him on a number of operations. When he was called into 617 Squadron, Martin gathered together most of his old crew with the newly commissioned Whittaker sitting beside him in the flight engineer’s seat. After the raid, he was promoted again and won his first DFC in September 1943, overdue recognition for a tour completed a year previously. The Martin crew carried on flying throughout the autumn and winter and on 12 February 1944 set off on an operation to attack the Antheor viaduct in Southern France. This was a disaster. Martin’s aircraft was hit by a shell which killed bomb aimer Bob Hay, wounded Whittaker and damaged the aircraft severely. Martin’s supreme skill as a pilot and Whittaker’s careful handling of the engines meant that they were able to make a dangerous landing at a tiny airport in Sardinia. In March 1944, after forty-four operations, he was finally transferred into a training unit, where he served to the end of the war. He stayed on in the RAF after the war, eventually transferring to the Technical Branch and rising to the rank of Group Captain, finally retiring in 1974. Whittaker was married with three sons. The family lived in Wendover, near the Halton base where he had first joined the RAF before the war, and he died in its hospital on 22 August 1979. Further information about Ivan Whittaker and the other 132 men who flew on the Dams Raid can be found in my book The Complete Dambusters, published by History Press in 2018. The man in the overalls on the far right is John Winterbottom, aged 44 in the photo. He was born 2 Jan, 1899 in Oldham, Lancashire, England. He married my grandmother’s sister, Ethel Bright in April 1928. I remember seeing a framed copy of this photo on the mantelpiece in his home when I was 14yrs old in 1969. In 2011 when I was researching in England I was able to scan a copy of the photo for my collection courtesy of my cousin. He worked at Avros Aircraft Factory during World War II as an Aircraft Fitter. One of the jobs he was involved with was the modification of the bomb bay doors of the Lancaster Bombers for the Dam Buster Missions which is why he is in this photo with Squadron No 617. Ivan Whittaker’s son, Tony, recently presented an arming pin to the RAF Halton Museum, as his father had gone through the apprentice school at Halton. The pin is said to have been from one of the mines used in the Dambuster raid and had been kept by his father Ivan Whittaker.